Once you've completed your painting project, you'll need to clean up, prepare extra paint for storage, and dispose of any waste paint. When it comes to cleaning paint brushes that are saturated with alkyd paints, you should work solvent into the bristles, squeezing out as much paint and solvent as possible. Repeat until paint disappears from your brush. Disassemble your roller and submerge the cover in solvent. When most of the paint has been worked out, wash the cover in mild detergent, and rinse in clear water. 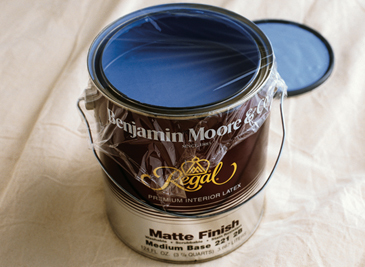 Remove paint from frame and hardware with a solvent. Hang your roller to dry. Follow the paint brush cleaning procedures noted above for alkyd paints, substituting soapy water for paint solvent. Use paints until they are nearly empty, reserving a small amount for touch-ups. Be sure to save alkyd products for hazardous waste collection. In most states, latex house paint disposal is allowed along with your regular household trash – after it has dried in the can. To accelerate the drying process, leave the can lid open and allow the can to bake in the sun. Then, leave the can open in the trash to show sanitation workers that the paint has hardened. Recycle your dry, empty containers in your local recycling program. Also consider donating any products you do not use to a nearby community group or civic organization.